After two weeks spent in trying to learn how to pronounce the name of Burkina Faso’s capital city, we gave up: a real tongue-twister! It was the end of October 2012. In spite of the above failure, we began preparing the new adventure of the Italian DX Team. At the outset, some of us were somewhat perplexed, since this country was clearly not among the “most wanted” ones. Its ranking beyond the 100th place was such that we could not expect to raise support from any international Foundation. In spite of this difficulty we decided to carry on, and with the help of national and international Associations, along with a few ARI branches and some firms from the amateur field, we got close to matching the required funding and could afford to launch this new initiative. Much as we proved on prior dxpeditions, we knew that the “most wanted” rankings do not tell the full story, with aspects beyond the simple numerical order. Once again, in fact, the number of QSOs from XT with unique callsigns (i.e. the number of OMs worked, independently of band and mode) turned out to be quite respectable: almost 23,000. This country was clearly in more demand that one could believe. With full respect for the reliability of the data-gathering process leading to these lists, we believe they do not faithfully represent reality, since they are based on a restricted number of amateurs and – most important – often the same, to a large extent. Unfortunately, in fact, few OMs take part in the “most wanted” polls. As a consequence, on several occasions we activated countries apparently not so much sought after, but which produced in the end numbers of contacts close to the typical totals of countries in great demand. After this clarification, a summary of what happened with XT2TT in February/March 2013. As we said before, it all started at the end of October 2012, when Silvano and Stefano found on the web a location suitable for our purposes. Since that moment we launched a feverish search for what is the crux of all dxpeditions, i.e. how to obtain the licence. We found out that Hugo, XT2HB, was witness at the wedding of our friend Jean TU2OP, and that both are IARU representatives for their respective countries. We commited Alfeo with the task of contacting Jean, to act as go-between with Hugo….and after a few days Hugo came back by email with the reassuring news that the licensing procedure would be as smooth as silk. We did not really believe it, but we got anyway on the move with our organization of the dxpedition. At this point a pleasant surprise: a few days later we received an email from our good friend Mac (JA3USA), informing us that he was about to visit Hugo, whohad been his guest while at the Osaka APDX Convention 2012. Informed of our plans, he was asking whether he could join us for a few days. In no time we assured him that his participation would be a privilege for us! Mac became on the spot a honorary member of the Italian Dxpedition Team, a somewhat unusual feat but Mac is a very special person for all who know him, for us almost a” japanese-speaking italian”! In fact, Mac had just this relevant role during his week spent in Burkina Faso. We profited from his presence to run SSB contacts at full swing with JAs, often the “vex and delight” of our pileups…As mother-tongue operator he was able to work more than 3000 unique JA calls in a week, allowing us to concentrate on the pileups from other countries. We could see him operating from IH9P in 2002, and on that occasion the team in Pantelleria achieved first-place in the CQ WWDX Contest in the Multi/Multi category, so we already knew his prowess! In addition, the close friendship between Mac and Hugo helped toward a swift licencing. Mac speaks also a fluent English, having an American wife and sharing his time between JA and USA. As a consequence, we “enlisted” him also on the pileups with North America…overall, me made him earn his honorary membership! Unfortunately, a few days before our departure we got worrying news from Gino (IK2RZP), who had to relinquish his participation because of serious family problems. Later in the dxpedition we received reassuring news relieving our apprehensions. All was fine. The entire team (I1HJT, I2YSB, IK2CKR, IK2CIO, IK2DIA, IK2HKT, JA3USA) flew together to Burkina Faso. We met at Malpensa airport on the 21st of February and flew, as usual, Air Maroc via Casablanca. We had flown this carrier seven times before, and we trusted that no problems would arise. However, never trust Africa! At Malpensa airport our diligent Air Maroc official (always the same one, but each time - since seven years - thinking up new tricks) refuses to check our equipment “because it is dangerous” (?!?!). Following a brief negotiation, all of a sudden he remembers this strange group of people, and finally agrees to our boarding the flight. After an uneventful flight and a brief stopover in Casablanca, we land at Ouagadougou in the very first hours of 22 February. On arrival we are welcomed by our new friend Hugo, who had forewarned the customs officials. As a consequence, and to our greatest surprise, we get through customs like it were an unguarded highway gate! Our heartfelt thanks to Hugo for his preparatory work. Later, we were told that without his assistance we could have not entered the country with our equipment. In fact, the civil war in Mali is only a few hundred kilometers away and the local authorities are on a high level of alert for terorrorist infiltrations. Under these circumstances importing telecommunications equipment would have been quite impossible without the permission obtained by Hugo from the Ministry of Telecommunications and the relevant army official. Our deep thanks to Hugo for this red carpet prepared in advance! A short transfer with the courtesy bus, and we reach the OK-Inn Hotel, just next to the airport and close to a large customs storehouse. We are welcomed by quite a number of “masseuses” offering to relieve us of our fatigues, but we came for other purposes and decline their proffers (somebody even considered a second trip for a no-radio vacation!). After a few hours of rest we begin the assembly and installation job. As usual, Stefano and Vinicio set up stations and internet connections, while the others concentrate on installing the antennas. We let Mac sleep a little longer, in order to help him recovering from his jet lag between Japan and Africa. We discover form the very beginning that the internet connection, very slow and unstable, will be very problematic. In addition, a conflict arises between the IP address of our local network and the rest of the hotel network. After hours of changes and adjustments we achieve a reasonable stability of connections, with the updating of our online log set at a period of three minutes instead of the foreseen one minute. Not so bad, given what we had to experience on other dxpeditions, but striving for the best we contact Giacomo (IH9GPI) for a better solution. No sooner said than done! Skipping details, in the end everything works as planned, with stable updates every minute, barring some periods without connection to the local provider, when we were forced to wait. On these occasions we warned Arturo (IK7JWY, our pilot station) who informed promptly the Deserving via the dedicated forum on HamRadioWeb.org. As per our customary procedure, the first CQ is to be called by the team member last arrived, and an excited Mac sits in front of the first completed station. At 11:25 UTC of 22 February XT2TT is on the air. Needless to say that the pileup is fierce, but Mac, after a few minutes of acquainting himself with the K3, hits a QSO rate of 250 per hour. We leave him with this new toy and proceed with the mounting of further stations and antennas. In less than 36 hours all is ready: beams, verticals, Beverages and diamond loop for receiving, the whole equipment optimized and four stations, including 6m, active. The only missing piece is the 160m antenna. This year we opted for an inverted-L at about 23m above the ground. Alfeo had trained for two months at throwing a lead weight with a “professional” sling, reaching a quite respectable level of proficiency. However, in no time this is dwarfed by the ability of Marcello, a skilled fisherman, who, with fishing rod and reel, in less that two minutes and a couple of launches sets the 160m antenna perfectly in place. All this under the astounded gaze of the nearby customs officials, wondering what that foreigner with a fishing rod was doing launching wires above the trees…but this is Italian Dxpedition Team too! 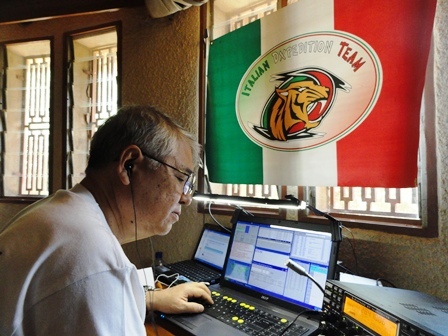 Days go by quickly when on a dxpedition, but surprises are always lurking: on the third day, Vinicio is on the CW night shift. We decide to spend the night on 40, 80 and 160m. Ready, set, go…but the SWR skyrockets! Frantic checks of cabling, then of the antenna: in the deep of the night a loud cry (translated form an Italian dialect): “we have been robbed of the radials!” That was exactly the case. Somebody had made his day by stealing all the radials of the 40/80m CW antenna. Short of spares, we try to fit the radials of the 160m inverted-L, but we must give up because of RF feedback and high SWR. Reluctantly, we concentrate on 160m and 30m, where we can log a good number of contacts. On the following day we purchase a few rolls of electrical cable (at a skyrocket price!) 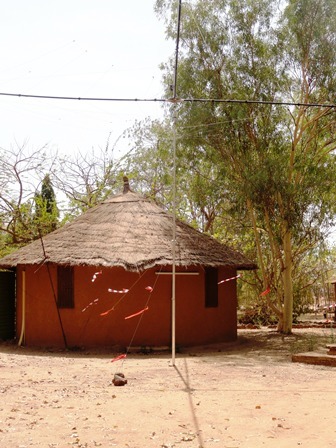 and, as a precaution, we move the antenna closer to our bungalows. But the local Arsenio Lupin hits again, and for a second time, during the night our radials are gone. We begin to get nervous, thinking of the possible damage to the other verticals and beams, were their guy wires be stolen. We purchase yet again rolls of wire (at the same price!) and decide to hire a guard to watch our equipment. An unforeseen expense, but necessary to prevent greater loss of materials and of activity on the lower bands. Once this problem was solved, all went well and smoothly. After a week Mac must go back to Japan, leaving the SSB station to Marcello and Stefano, whose efforts keep the station active 24 hours a day. 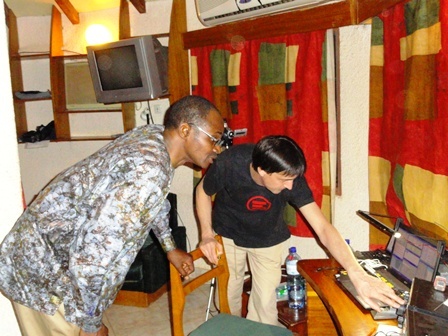 Silvano and Vinicio help them, but Silvano has also the reponsibility of both the RTTY and the 6m stations. The latter has a major surprise in store for the last two days. Up to day 12 we had less than 400 QSOs in the log, but at the last moment, almost like throwing a switch, we got an exceptional opening to Europe and we could log a total in excess of 1500 contacts. Unfortunately, no way for South America on 6m: every evening we turned our antenna toward PY and LU but in the end we could make only a handful of contacts. We tried hard! 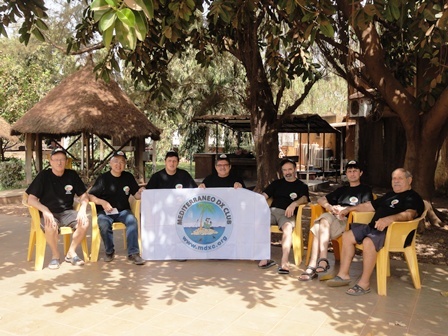 During the dxpedition we were greeted by the visit of a Japanese team, in Burkina Faso for a university convention. They had brought along some of their radios; at times we were on the air at the same moment, but without any mutual hindrance. We immediately got along without any competition. On the contrary, we had nice exchanges of ideas and knowledge, which strengthened the human aspect of our hobby. They wondered at the operating ability of Angelo IK2CKR during a frantic European pileup, a display of professionality and competence which made us proud, and compensated for the many unforeseen events and emergencies we had to face during our dxpeditions. Time went by quickly. After a first week with unstable propagation with random openings on the higher bands, during the second week the situation stabilized with good openings from 10m to 20m for the whole period of daylight. This helped raising our total score to a considerable number: on 6 March we closed down at 17:26 UTC with more than 76,000 QSOs, well beyond our expectations.In the late afternoon of the same day we began dismantling operations, which were completed within two hours, including packing for shipment.Just in time for a last shower and dinner, and we are at the airport for our return leg. All safe and sound but for Angelo who, having spent a half hour under a chilly stream from an air conditioner at full throttle, suffers from a heavy congestion which will last for the whole trip. At 14:30 UTC on 7 March we land at Malpensa airport, where our good Piero is awaiting us with a van for the final run home. This one is over, too, but we are already prepared for the next action, which should take place before the end of 2013. We thank wholeheartedly all our sponsors and those who, directly or indirectly, support us in our endeavors. Special thanks go to Hugo, XT2HB, for his most precious collaboration, to Giacomo, IH9GPI, for his outstanding real-time log, to Arturo, IK7JWY and Sergio, IK0FTA, our pilot stations who kept the team and the OM community informed through the HamRadioWeb forum. See you “on air” from the next venue of the Italian Dxpedition Team!